Villagers of drought-hit Maan in Khanapur Taulka (50 kms from belagavi) are getting only two pots of drinking water against one ration card, every alternate day, from the village well. After this story was published in the New Indian Express, the govt woke up and decided to get water from the River flowing nearby. 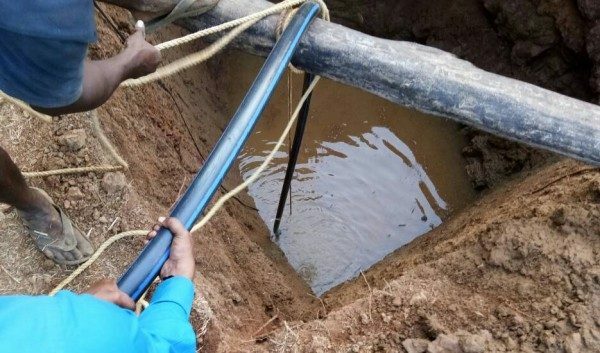 A plan was made that the water from the flowing river will be pumped up and stored in a pit, from where it will pumped again into the pipelines for distribution. So the Govt gave the contract to dig the pit to store water, about 10-12 feet in width and 30 feet deep, and miracle happened, live springs about 10-15 sprung up in the pit at 30 feet and the pit was full with clean water upto 10 feet. The water from the same pit is now been pumped and supplied to the households. The digging of the pit has come as a boon to the villagers. Now each household gets more than the 2 pots of rationed water. Happy to read.. God listen to prayers.. Regards to govt authorities who worked on it and happy villagers of Maan.